The following list was written by user202729 and serves as the guide to this forum thread. Scrolling text demonstration with video. Hackstring used to dump the ROM. No longer needed now as we already have the ROM. Datasheet contains some information about the hardware. Hardware description: Part 1, part 2. * Timer: Part 1, part 2. Variable byte representation (no English translation this time). There are some outdated information about "real address" and "emulator address". Now we had the real ROM of the calculator that is not necessary. Edited by SopaXorzTaker, 28 February 2018 - 02:22 PM. More information on the chipset can be seen at the bottom of this service manual PDF for the CFX-9805g plus where it shows the schematics and pinouts of the CPU and some other stuff. The download button will say "..Processing.." you have to wait about 60 seconds before it will say Download Now. The CPU may still be a different chip (but the same architecture), as the LCD controller and RAM are integrated now. Edited by SopaXorzTaker, 21 August 2016 - 05:42 PM. There are lots of test points, I could try attaching a logic analyzer and recording the signals later. Edited by SopaXorzTaker, 21 August 2016 - 05:57 PM. Interesting are P156-P159 which seem to be some kind of a debug port. Also, note the vertical row of three contact points near P101. These don't go anywhere else, which suggests that they might be reserved for testing. Edited by SopaXorzTaker, 21 August 2016 - 06:06 PM. Note how P101 is solder-bridged on your board. I guess that's a configuration jumper that changes some functionality. Maybe has to do something with the lack of a solar battery? The HCD62121 has only 120 pins, while the test points are numbered to approximately 170. This may suggest of a higher pin count. Yes, as I have noted. This can be used to create hackstrings with "r". Edited by SopaXorzTaker, 21 August 2016 - 06:37 PM. 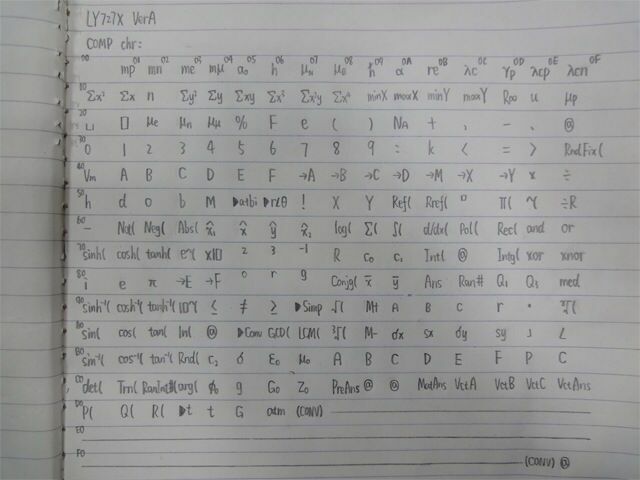 In this table, we have the characters on bytes 00-D7. This allows for embedding some instructions into the hackstrings if we figure how exactly are the strings executed. 8B (Ans) that is used in the hackstrings is BF label, jumping to the address in the following byte. N being 13 (dec) in this case. No idea what disp is though. EDIT: disp is the effective base address. Try clicking the instruction mnemonic names in that table to reveal detailed descriptions. Edited by SopaXorzTaker, 21 August 2016 - 06:53 PM. No, disp is here meant to be "effective address". Hm, must be an abbreviation. @kaikun97, could you try entering the following hackstring, please? The Vm character can be found in the CONST menu (constant #26). Edited by SopaXorzTaker, 21 August 2016 - 07:00 PM. Also 9D is for 1001 1101 but the instruction you mentioned was 1001nnnndddddddd so what about the 1101 part? It means that R13 is used by the instruction. AFAIK there are sixteen 16-bit registers. Edited by SopaXorzTaker, 21 August 2016 - 07:04 PM. E as in the ALPHA mode. By the way, SuperH may not be the exact instruction set used. HCD62121's set significantly differs. Let's try using its instructions too. By the way, the Hitachi instruction set does not look like SuperH in some aspects. Could you try executing the following sequence, please? A as in the ALPHA mode, Sqrt is the square root symbol with an opening brace. It might just print "ERROR" without any other text because of the look up table where the error names are located overflowing. Edited by SopaXorzTaker, 21 August 2016 - 07:36 PM. Idea: try using the hackstrings with those a and b instead of r. It might work. I did but it displays Math Error. The A and B things only work if they are by themselves, but if I put other stuff with it it will say Math error, I am not sure why. Also, the sequences for Ans and r do not match up with Hitachi instructions. No idea why, they do match to the SuperH ones though. 89 is jump A24, as per Hitachi. This means jumping to address contained in the next two (16) or three (24) bytes. It *may* explain some of the glitches encountered, though I don't know what r and Ans do, as they correspond to undefined instructions. Where x is that X character with a hat. Corresponds to jmp 0x282828 (Hitachi), which might do something. 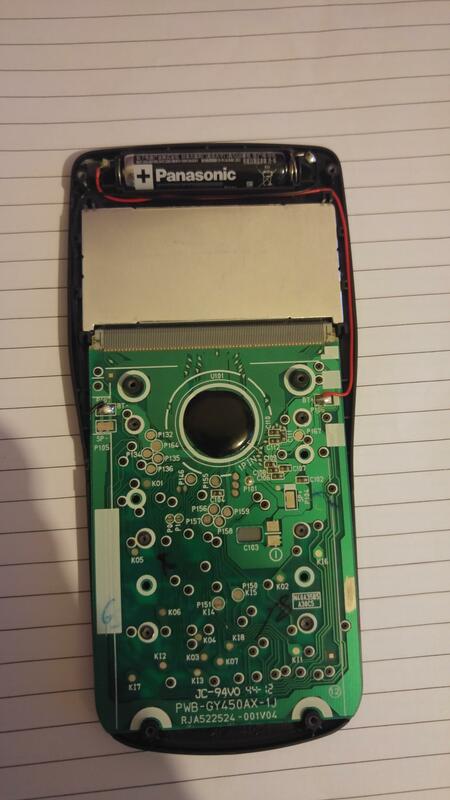 By the way, this Baidu Tieba thread shows some weird firmware running on a calculator. Any ideas? Edited by SopaXorzTaker, 22 August 2016 - 05:42 AM. That's interesting. I guess that a and b have some special values. Maybe we can try further abusing them? And by the way, my calculator just crashes when I try to store them, it shuts itself down and resets the settings. 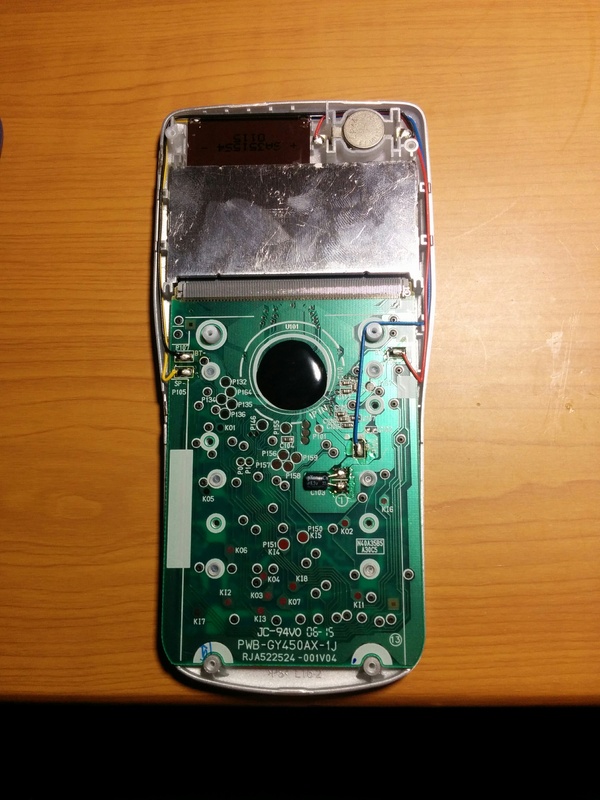 Can you please take your calculator apart (if you do it carefully, it won't break) by unscrewing the screws on the back and opening the case? If you can, please photograph the circuit board inside. This may help in our research. You can also test the hackstrings which we were discussing above. Edited by SopaXorzTaker, 22 August 2016 - 06:27 AM. Oh yeah. Maybe try that sequence then? The Sqrt character is 0x98, which corresponds to JMP reg. Edited by SopaXorzTaker, 22 August 2016 - 10:06 AM. @kaikun97 - could you please ask on cncalc.org whether they have a ROM dump for fx-82ES? That would simplify our task, as the calculators share the codebase. Also, can you please test the glitch described here on your PLUS model? Try replacing the Sqrt with another function such as log, ln, etc. The behavior should change. This would prove that the hackstrings are actually executed as data by the CPU. I don't know chinese. I have looked quite a few pages back and couldnt find anything. I am digging into it right now. Looks interesting. Looking up that character. I think it is another valid instruction. That character is 77 hex. Hitachi instruction: sub mem(reg indirect), reg. Probably corrupts some memory location. I think that triggers data corruption, so the calculator hard-resets itself. Edited by SopaXorzTaker, 22 August 2016 - 10:35 AM. It froze when I used 1a. Hm. The "Complete" text does not encounter anywhere in the normal menu, so must be some debugging feature. Now that's interesting. Update: seems like the emulator unfortunately did not contain any executable code. Edited by SopaXorzTaker, 22 August 2016 - 11:17 AM. The fact that you get characters with digraphs proves that there is another character codepage for text which partially goes unused. Edited by SopaXorzTaker, 22 August 2016 - 11:24 AM. Not digraphs, sorry, my mistake. I meant diacritics. Hm, nice. What if you try putting the hackstrings into the table? Edited by SopaXorzTaker, 22 August 2016 - 11:39 AM. The emulator seems to be a packed executable. I think I found some data in it though. Could you please extract the resources from the emulator's executable? I use Linux, so I am unable to. You can use this program to do it on Windows: link. Zip the extracted files and upload them somewhere. If the emulator actually emulates the Hitachi chip, we can find some code for it in the executable. There are many binary blobs. If you find some of them which are a power of two bytes in size, such as 16384, 32768, one of them might be the ROM image. I will try decompiling it if you want. Edited by SopaXorzTaker, 22 August 2016 - 12:49 PM. Thanks. Unfortunately, there aren't any ROM images, which suggests that only the calculator's software, not hardware is emulated. @kaikun97, want me to test something on fx-991ES PLUS? Yeah, almost every use of glitch characters crashes it. However there are exceptions. Also, typing in a or b makes the cursor a small dash instead of a vertical line. By the way, I found that pressing ON unfreezes the calc. Edited by SopaXorzTaker, 22 August 2016 - 01:43 PM.